Yasi Zeichner will teach some basic sean-nós dance steps that you can pull out at any Irish session! One of the oldest styles of Irish step dance, sean-nós encourages the dancer to interpret the tunes with their feet. This workshop will give you tools to create your own steps. Bring smooth-soled shoes with a medium heel. Live music at this workshop will be provided by Oliver and Louli Zeichner. 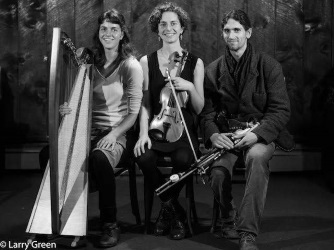 The Zeichner Trio, a sibling band, hails from Northfield, Vermont. Irish language classes meet each Sunday. Study materials and instruction provided free; no age limit for those interested. Beginners 1:00-2:00 pm; Intermediate: 2:00-4:00 pm. Contact Liam McKone at vtfenian@gmail.com for further information. An afternoon of live traditional Irish music (by Denise Dean and friends) and dance, this ceili (community celebration) will feature the traditional social dances of Ireland, along with a few special performances. Dances will be taught on the day and all are welcome to participate! Neither experience nor partner needed. Please bring clean soft soled shoes and join us for an afternoon of dancing, music, food, and fun for all ages! 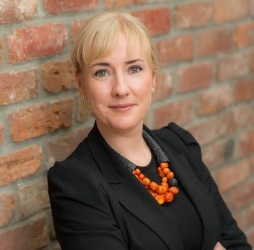 Fionnuala Quinlan, Consul General of Ireland for New England, is delighted to visit the 2019 Burlington Irish Heritage Festival. Consul General Quinlan will speak on the history and context of the Good Friday Agreement. The Consul General will also explore the current issue of Brexit and how it impacts Ireland. Moderately paced, all welcome. 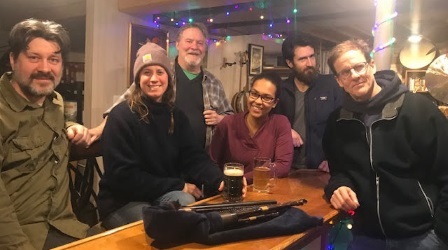 Every first and third Thursday of the month, the Jericho Cafe and Tavern plays host to a traditional Irish session open to all Irish musicians. Like all sessions, it has its own flavor. It is designed to be less intimidating and a comfortable place for people of various experiences to share a tune. The intention is to include all who want to play. “Johnny” Burns, as he was popularly known, was one of the most interesting individuals ever to serve as Burlington’s mayor. He was a member of the pioneering generation of American aviators and helped establish the Burlington airport. An avid sportsman and superb athlete, he might have played major league baseball but for the outbreak of WW I. As mayor he strongly advocated for the beautification of the city’s waterfront and led the Queen City through the challenging years of WW II. 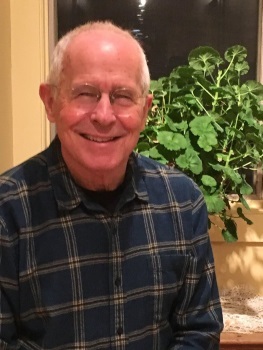 Vince Feeney is a local author, scholar and historian with a keen interest in the role of the Irish in Vermont. 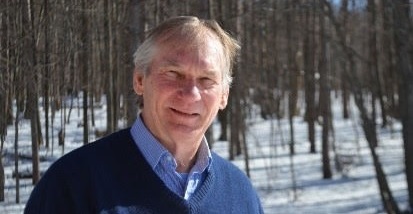 Vince was one of the original founders of the Burlington Irish Heritage Festival. Location: Pickering Room, Fletcher Free Library, 235 College St., Burlington. Kick off St. Pat’s with O’hAnleigh at Radio Bean. 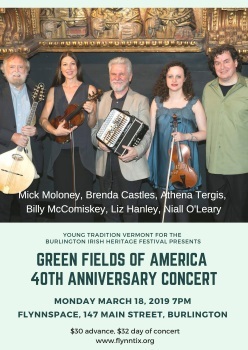 Vermont’s O’hAnleigh (Tom Hanley, Becca Hanley, Doug Riley and Cindy Hill) bring the traditions of Irish immigrant culture, history, literature and music to life with dynamic performances including toetapping sing-along pub favorites, haunting ballads, sizzling fiddle tunes, and original songs based on Irish myths and legends. 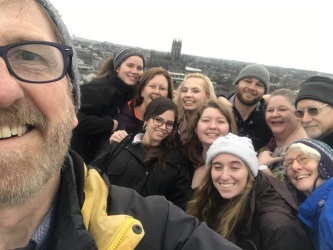 The Community College of Vermont’s (CCV) fall 2018 class with Peter Keating culminated in a 10-day January trip to Ireland. The 14 students, along with CCV faculty and staff, documented their trip highlights in hundreds of photographs, now consolidated into an exhibit of 20. Come and enjoy the photos, meet some of the students and enjoy a brief reception with CCV staff, students and guests. The exhibit is expected to hang for two weeks. Join Ed McGuire of the Vermont Genealogy Library for discussion of the records, tools and techniques for searching both here and in Ireland. This session will be followed by tours of the library’s resources and use of their subscription databases including Ancestry. com and FindMyPast.ie. Refreshments provided, Irish genealogy books for sale. After the publication of his best-seller ‘How the Irish Saved Civilization,’ Thomas Cahill sparked a debate about Ireland’s singular impact on our intellectual heritage. Did he go far enough? Irish monks helped preserve civilization, but Ireland’s poets, writers, playwrights, philosophers, and scientists were central in the development of many ideas we understand as crucial to that intellectual heritage. 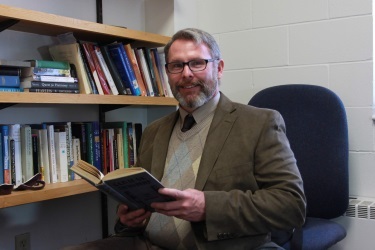 Saint Michael’s College professor, Patrick Standen’s lecture will delve into this rich intellectual tradition. 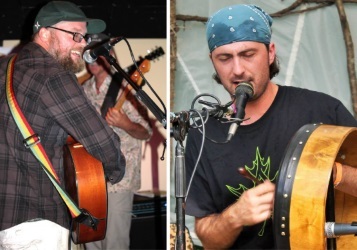 Reagh Greenleaf Jr. (vocals, bodhrán) and Dan Brown (vocals, guitar) play a fun mix of traditional Irish pub songs and ballads, with a healthy dose of country-folk, jam and world music. Dancing and singing along highly encouraged! 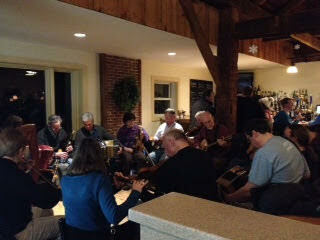 They are headlining the 3rd annual Killington Irish Festival, and have performed regularly at Rí Rá Burlington. 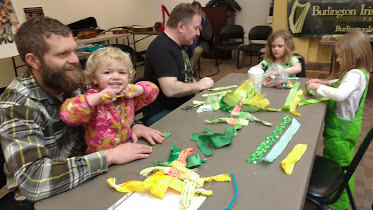 Share the Irish heritage with a new generation, or expand your children’s cultural horizons by creating some Irish-themed crafts. All ages are welcome. Adjoining the Children’s Crafts event, this is a chance for your youngsters to get up close and friendly with some of the most important instruments used in traditional music. Display and hands-on guidance graciously provided by Young Tradition Vermont. All ages are welcome. If you simply shut your eyes, you can begin to understand how the lack of sight can intensify your appreciation of sound, and of music in particular. In many cultures, including in Ireland, blind children were trained as musicians. Why this was, and who some of these musicians were, will be the subject of this lively talk and concert. 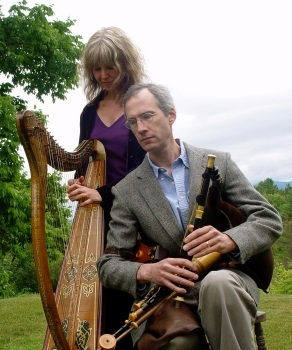 Multi-instrumentalists Benedict Koehler and Hilari Farrington are known across the U.S. and Canada as teachers and performers of Irish traditional music. 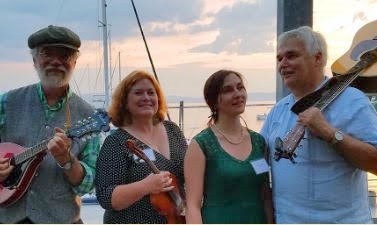 Founders of the Vermont School of Irish Traditional Music, this couple has helped to create and promote a thriving Irish music community in the state. The tin whistle, iconic instrument of Irish music, is a simple, yet amazing instrument. At this workshop students will use D whistles to learn the basics, plus a few tunes by ear. Attendees are encouraged to bring a recording device. Sheet music for the tunes will be provided at the end of the workshop. 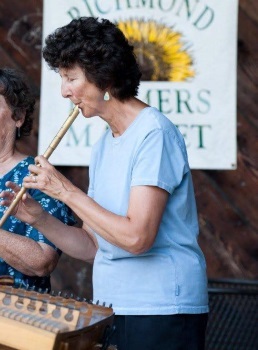 Mary Ann Samuels has played tin whistles since the late 1970’s. She performs with Full Circle and Champlain Consort, playing hammered dulcimer and recorders as well as whistles. She has taught music in schools and now teaches private lessons at home. Tin whistles available for $15. Join us for an evening of Irish music ranging from jigs and reels, your favorite pub songs, to the Pogues – all to benefit Pathways Vermont. 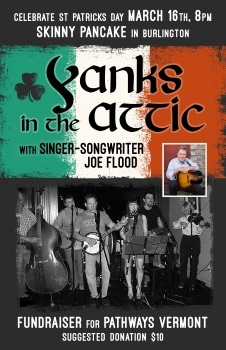 Yanks in the Attic, with special guest singer/songwriter Joe Flood, will help you bring in St. Paddy’s day while helping folks who help our neighbors. Please join us. ‘Ceili’ is the Irish word for a music, dancing, hand-clapping good time! The annual Festival Ceili, co-sponsored with Young Tradition Vermont, is fun for the whole family with Irish step dancing and some fine traditional musicians. Hear fiddles and flutes, Irish pipes and pennywhistles; and the bodhran, an Irish frame drum. 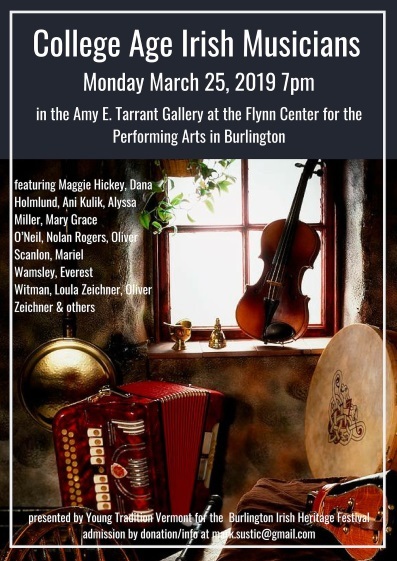 This music session will be hosted by Sarah King and Yasi Zeichner (from Young Tradition Vermont) with others, featuring the finale of the YTV Fiddleheads residency. Area musicians are welcome to bring their instruments and join in for a lively seisiún. Bake sale; display tables with information on Irish language, culture and other events. Members of the McFadden Academy of Irish Dance will perform and also lead audience participation in Ceili dances. Grand Prize drawing for “Luck of the Irish” raffle at the end of the Ceili. 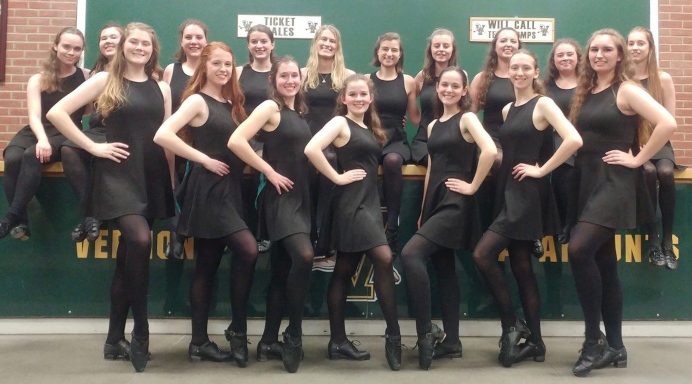 The Celtic Cats (UVM Irish Step Dance Club) will perform recent and varied pieces, followed by the Ceili. The Celtic Cats St. Patrick’s Ceili is UVM’s premier Irish cultural event. It is the only strictly Irish event on campus each year. There will be performances by the UVM Celtic Cats and guests, as well as participatory Ceili dances where we will teach you everything you need to know! Irish themed refreshments will also be provided so bring your appetite. Admission: $5 admission for children under 10 or with a UVM, St. Michael’s, Champlain or Middlebury affiliate ID; $7 for the general public. 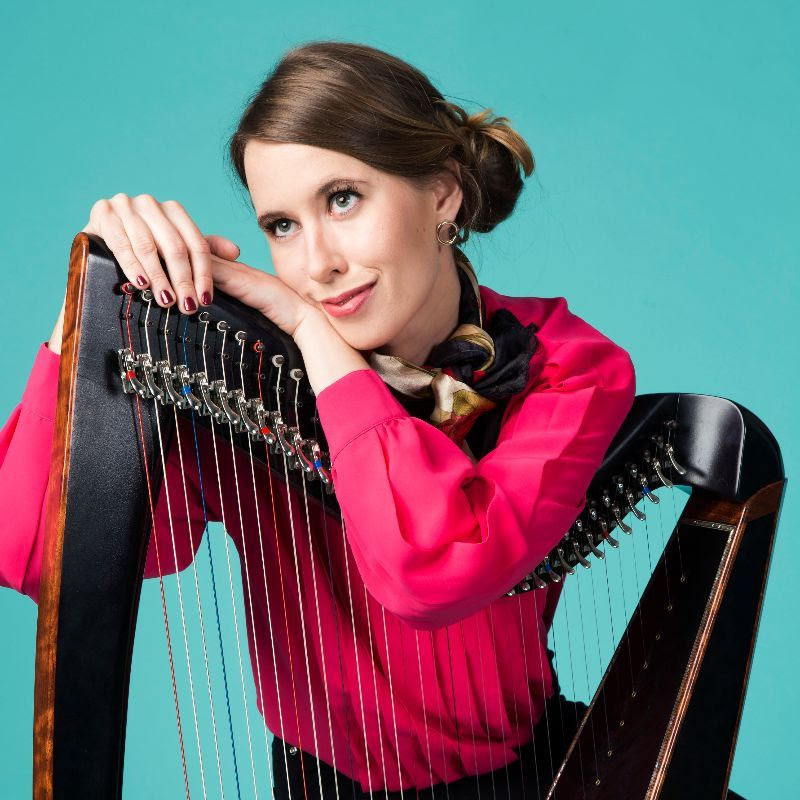 The talented Maeve Gilchrist will conduct a workshop for harpists of all levels. Participants will need to bring their own instruments. Born and raised in Edinburgh, Scotland, and currently based in Brooklyn, New York, Maeve’s innovative approach to her instrument stretches its harmonic limits and improvisational possibilities. She is as at home as a soloist with an internationally renowned orchestra as she is playing with a traditional Irish folk group or using electronic augmentation in a more contemporary, improvisatory setting. She tours internationally as a band leader as well as maintaining a number of collaborations including a duo project with percussive dancer Nic Gareiss, an electronics based project with Viktor Krauss and as a member of the Irish network commissioned ‘Edges of Light’ quartet. 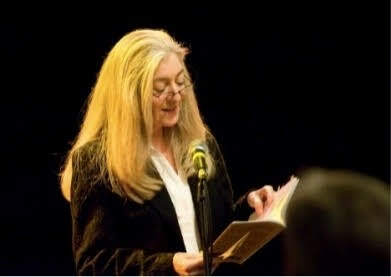 She has appeared at such major music events as Celtic Connections in Glasgow, Tanglewood Jazz festival, the World Harp Congress in Amsterdam and the opening of the Scottish Parliament. 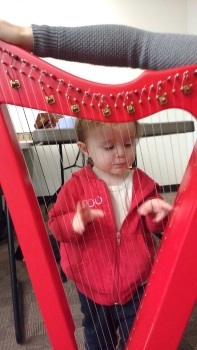 This concert features Maeve’s composition for solo harp, The Harpweaver. The show will be opened with a set by seven talented young harpers from Vermont who study traditional music with Dominique Dodge.